In his latest blog for PakPassion.net, Yasir Arafat writes about the positives to be taken from the tour of Pakistan by an under-strength West Indies side, why the Pakistan Super League (PSL) has proved crucial in improving Pakistan's bench-strength, his views on the recent controversy triggered by Shahid Afridi's comments on social media and his own aspirations to eventually coach a national side. I understand that there were some concerns expressed about the one-sided nature of the recently concluded T20I series between Pakistan and the West Indies. However, whilst the West Indies side was below-par in strength, we must recognise the fact that in the history of Twenty20 cricket in Pakistan, our current team is the best combination of players we have ever had. If we look at the captaincy of the team, then in Sarfaraz Ahmed we have an impressive captain who is leading from the front and also has instilled an aggressive brand of cricket into his team. Of course, the final scoreline of the series did also reflect the fact that despite having qualified for the World Cup in 2019, the West Indies did not send their strongest squad to Pakistan. The side had players like Marlon Samuels and Samuel Badree who could be called recognised players but apart from them, there were hardly any well-known international faces in the visiting West Indies squad. This West Indies team was no match for, and totally overshadowed by a near full-strength Pakistan team which is really at the peak of its abilities at the moment. In the old days, Pakistan’s bowling strength was good enough to help us take care of opposing teams, but the modern game has changed, and fielding and fitness are key factors in any team’s success at the international level. In the case of the current Pakistan T20I squad, it's clear that there are no weak links in this group of players. Each player is fit, and the fielding abilities of each team member are extremely good. We have some fine examples in the shape of Shadab Khan, Faheem Ashraf and Hasan Ali who field with the energy that one expects from young players. Of course, our bowling and batting have always got us good results, but what is really amazing and heartening now is the excellent quality of our ground fielding. Whereas even today Pakistan's bowling and batting performances are subject to ups and downs due to the form of individual players, our progress in the fielding department is amazing. It's become quite usual to see excellent efforts made by Pakistan fielders to save boundaries or take fantastic catches or to prevent singles and also affect spectacular run-outs with direct hits at the stumps. All in all, it’s a great time to be a Pakistan supporter, thanks to the excellent team combination in place. We recently saw three very impressive youngsters make their debuts for the Pakistan T20I side. To me, the inclusion of Hussain Talat, Asif Ali and Shaheen Shah Afridi in the Pakistan side is a testament to the success of the PSL in improving our bench strength. A young and talented player’s self-belief and confidence gets a huge boost when they play 8-10 televised matches in front of good crowds and under the expert supervision of some world-renowned coaches, and against teams which have some top quality international stars. Of course, we already have other Twenty20 tournaments in the country, but none can match the quality of the PSL and the proof of that is in the improved bench strength of our Limited-overs sides. If you take the example of Shaheen Shah Afridi, you will note that even after playing the Under 19 World Cup, it was not expected for him to be seen in Pakistan colours for a good 3 years as he would have needed time to be mature enough to play at the international level. But once he had played in the PSL, we saw the confidence with which he bowled in his first game against the West Indies which shows what an important role the tournament is playing in bringing fresh talent to the fore. Speaking of Asif Ali, I am convinced that he is a very attacking and effective player as we have seen how he single-handedly helped Islamabad United win games in the PSL. I am hopeful that the selectors will give him more chances in the future based upon his PSL performances. He is a promising player who needs to be persisted with and given more chances to represent Pakistan by the selectors. I also feel that Hussain Talat had an excellent series against the West Indies and in my view, should have been named the player of the series. To me, Talat is a prime example of what is good about the current Pakistan Limited-overs teams, in that he is excellent in all three departments of the game. And once again, I credit the PSL for this transformation to our cricket where each young player coming out to play for Pakistan from this tournament is mature, groomed and ready for international cricket. It is understandable that all of us who wish well for Pakistan cricket, would like to see solid international teams visiting the country and playing competitive cricket. We would also like to see some close games as they are also appreciated by the crowds at the grounds. And yes, the series was one-sided as the margin of Pakistan’s victories in each of the 3 T20Is indicates but we have to understand that there were some mitigating circumstances which we need to consider before being too harsh on the PCB in this regard. Some of the West Indies players had existing IPL contract commitments which would have conflicted with this tour as the team was assembled with some haste. 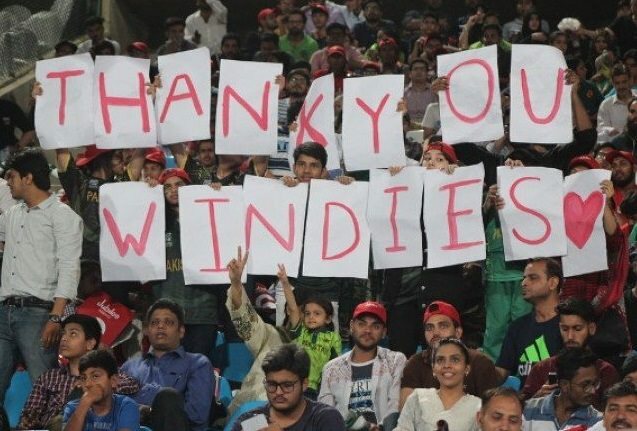 Others had some reservations about travelling to Pakistan due to security concerns, whilst a few do not have a good relationship with Cricket West Indies. Instead of worrying too much about the strength of the West Indies team which visited Karachi, we should be thankful that this series did take place in the first place. I, for one, am very pleased that international cricket is slowly making its way back to Pakistan but fully understand that this is a slow process. If we think that based on the tour of the West Indies, Australia will decide to send their team to Pakistan in the short term, then we are sadly mistaken as the full revival of international cricket will take its time. This will only happen when the confidence in security in Pakistan is restored for the visiting players and teams which is why tours such as that undertaken by the West Indies are so important. The signs regarding restoration of international cricket in Pakistan are all very good. At the end of the day, we must accept the fact that it is up to the boards of the various countries to decide whether their teams will visit Pakistan or not. The inputs regarding the security situation in Pakistan of the various players’ associations for each country such as England, Australia or New Zealand also play an important role in the final decision by the boards of different countries to tour Pakistan. The good news as far as Pakistan is concerned is that the series against the West Indies passed by without any incident or mishap. The tour can therefore be deemed a complete success from an organisational point of view. I would like to offer my personal and heartfelt congratulations to the Government of Pakistan, the security forces and the PCB for all arrangements regarding the successful tour by the West Indies. Realistically speaking, we all know that the security situation in Pakistan can take a turn for the worse at any time, so it's really up to the boards and their players to make their own decisions about visiting Pakistan. All we can say at the moment is that based on what we have seen so far, the signs regarding restoration of international cricket in Pakistan are very good. The recent spat on social media between Shahid Afridi and a few Indian cricketers has caused some controversy. Let me say that I am a firm believer in the approach that the politician’s job is to practice politics, whilst a sportsman’s job is to play a sport on the field. It makes no sense and does not seem right for me as a sportsman who knows little about foreign affairs to start discussing such matters on social media. Let the politicians handle such matters as sportsmen talking on these issues does not look nice under any circumstance. I am very pleased to have qualified last as a Level 3 ECB Coach. I also did some coaching for Hong Kong in the recently concluded World Cup Qualifiers tournament. In addition, I am also coaching in a private college in London at the moment and also do short two-week coaching stints in various counties. As for the future, I would like to use my experience as an international player who has played all formats of the game as well as my coaching qualification to impart knowledge to any youngster who wishes to learn from me. My ultimate aim is to coach some of the County teams and then look to use my experience at the national team level too. For that to happen, I need to take it one step at a time and learn the art of coaching similar to how I improved my cricket over time. So, the idea is to take it slow and steady and begin with coaching some County or T20 teams and then hopefully progress to coaching a national side which would be a great achievement for me.